UPDATE THREAD for the Falcon 9 mission with Thaicom-8. This mission is currently targeting a launch on May 26, with a launch window of 17:40 through to 19:19 Eastern. The first stage is already inside the SLC-40 HIF, with the Static Fire test currently scheduled for May 22. Delayed to May 27 at 17:39 local. See page 5 for second attempt updates. Dulles, Virginia 29 April 2016 – Orbital ATK, Inc. (NYSE: OA), a global leader in aerospace and defense technologies, today announced that the THAICOM 8 satellite has arrived at its launch site in Cape Canaveral, Florida. THAICOM 8 is the second satellite Orbital ATK has built for Thaicom PLC and is based on the company’s flight-proven GEOStar-2TM platform. The satellite arrived at the launch site after it was shipped on Wednesday, April 27 from the company’s manufacturing facility in Dulles, Virginia. THAICOM 8 is set to launch in late May aboard a SpaceX Falcon 9 vehicle. The satellite will support Thailand’s growing broadcast industry and will provide broadcast and data services to customers in South Asia, Southeast Asia and Africa. Commissioned in 2014, THAICOM 8 was ordered shortly after the company-built THAICOM 6 satellite was launched into orbit in January 2014. The design, manufacturing, integration and testing of THAICOM 8 took place at Orbital ATK’s state-of-the-art satellite manufacturing facility in Dulles, Virginia. A Ku-band satellite, THAICOM 8’s payload includes 24 active transponders that will deliver broadcast and data services. The Falcon 9 rocket will deliver the satellite into its targeted geosynchronous transfer orbit where it will enter a 30-day testing phase. Following in-orbit activation and after reaching its final orbital slot, Orbital ATK will then turn over control of the satellite to Thaicom to begin normal operations. THAICOM 8’s orbital location will be positioned at 78.5 degrees east longitude and the satellite is designed to operate for more than 15 years. The THAICOM 8 satellite is the 36th GEOStar spacecraft launched for customers around the world. Orbital ATK is currently producing several commercial satellites that will be delivered and launched for customers over the next several years, including the Al Yah 3, HYLAS 4 and SES-16/GovSat spacecraft. The company has also begun work on the new Mission Extension Vehicle-1 (MEV-1) for the company’s recently announced commercial satellite servicing agreement with Intelsat, S.A.
Nice photo with the press release. Sat at the launch site! Thaicom 8 brochure from Orbital ATK. Launch mass is < 3200 kg. That should give plenty of margin for a successful first stage landing. For what it's worth, SpaceX posted yesterday (5/16) on FB that the next F9 launch is "in about 10 days". Indicating the 5/26 date is still on track. And now they are showing the next launch in 17 days, which is ULA's NROL-37. Static Fire is May 22 on the last schedule update. Will keep an eye on any changes (as always). We're still at May 26 NET until I'm sent an updated schedule showing a change. The Range is currently under pre-scheduled maintenance of course. There may be rumors and such in the meantime, but we have the discussion thread for that. A documented change will go in here so that people planning to go to this launch - who usually have this thread on "notification" get to know about it. The rainy season has arrived in FL. Spotted the SpaceX fairings headed into Cape Canaveral. We think it is great SpaceX will recover in future, along with manufacturing them. This is 11 nmi ESE of its position for the JCSAT-14 landing, and 10 nmi farther from the Cape. Thaicom-8 is back on the KSC Visitor Center Schedule for 5/26/16. Viewing: "Launch viewing opportunities for THAICOM-8 are available at Apollo/Saturn V Center, LC-39 Observation Gantry and the main visitor complex with bleacher seating and launch commentary." "Located at the main visitor complex, viewing adjacent to Space Shuttle AtlantisSM is included in daily admission. The viewing area offers guests a view of the rocket once it clears the tree line. Bleacher seating and live launch commentary are provided. " FloridaToday reports static fire might happen on Monday - one day later then expected. 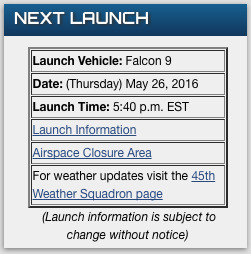 Right then, the rule is if you are in the Cape area and see a Falcon 9 sunbathing, post (or take a pic if possible) and post in this update thread, as that would be an update for the Static Fire. Process is (if they are going for it today) obviously: SLC-40 HIF door open, rollout on the TEL, usually hang around horizontal for a while, then erect vertical. If anyone then catches her venting, they we'll be close as it's the T-30 mins or so prop loading these days. Authority: EASTERN RANGE OP X0415 172011Z MAY 16. Static Fire windows are very long, several hours, to remove any pressure with GSE issues, etc. Worth pointing to the discussion thread as it's becoming clearer that it's going to be Tuesday for the Static Fire. So we're waiting on word of the F9's static fire today...today still allowing for a launch on the 26th. Orbital ATK has set up a satellite page for this mission - as they built the bird. Not sure about the launch window they note, as we've seen a latest schedule showing 1740-1940.